Oscailt Oifigiúil: Donnchadh Ó hAodha, Uachtarán Chonradh na Gaeilge. léacht le Donncha Ó Duibhir. An tAonach, Co. Thiobraid Árann. Donnachadh Ó Duibhir M. ED. Iar-mhúinteoir náisiúnta; seal ag múineadh Gaeilge i gColáiste Mhuire Gan Smál, Luimneach; iar-eagarthóír Gaeilge – Irisleabhar Staire Thiobraid Árann: comhúdar Finding Tipperary (cuid na Gaeilge); altanna aige ar lámhscríbhinní Thiobraid Árann, ar Thomás Ó hIceadha, ar Dhiarmaid Ó Riain, ar an Athair Mathúin Ó Riain, in Irisleabhar Staire Thiobraid Árann, Dúchas agus An Linn Bhuí. Rugadh Stiofán Ó Cadhla i Rinn Ó gCuanach agus choimeád sé an nasc leis an Rinn i rith a shaoil. Is ceann é ar Roinn an Bhéaloidis agus na hEitneolaíochta, Coláiste na hOllscoile, Corcaigh. Tá idir ailt agus leabhair ar ghnéithe den chultúr dúchais scríofa aige. Roghnaigh Cumann Merriman Cá bhfuil Éire? Guth an Ghaisce i bprós Sheáin Uí Ríordáin (An Clochomhar) mar Leabhar na Bliana 1998. Ba é An Creideamhach Déanach (Coiscéim 2009) an chéad chnuasach filíochta agie. D’fhoilsigh Cló Iar-Chonnachta An tSlat Féithleoige:Ealaíona an Dúchais 1800-2000 sa bhliain 2011, saothar anailíseachar bhéaloideas a bhuaigh an chéad duais do shaothar próis sna comórtais liteartha ag Oireachtas nabliana 2010. As Co. Mhuineacháin don Dr Éamonn Ó Ciardha. Céim sa Ghaeilge/Stair 1989, UCD; MA le Buachaillí an tsléibhe agus bodaigh gan chéille, Woodkerne, Tories, and Raparrees in Ulster and North Connaught in the Seventeenth Century 1991 UCD; Ph.D Cambridge1998. Tráth ina Thaighdeoir Cúnta in Ollscoil Aberdeen agus ina Thaighdeoir ag Acadamh Ríoga na hÉireann don Dictionary of Irish Biography, seal ag obair in Ollscoil Toronto agus in Ollscoil Notre Dame. Anois ina Léachóir Sinsearach (Dept. of English, History & Politics) in Ollscoil Uladh, Doire. Altanna agus leabhair foilsithe aige ar na Seacaibitigh, Teicheadh na nlarlaí, Planndáil Uladh agus Úsáid na Gaeilge mar fhoinse na staire sa 17 & 18 aoise. As Cluain Meala do Liam Ó Duibhir; iar-Mheán Mhúinteoir i gColáiste Charraig an Tobair, Co. Thiobraid Árann. An-suim aige i gcónaí sa Ghaeilge agus sa Stair go háirithe sa Stair Áitiuil. Ina bhall den Chumann Gaelach (Conradh na Gaeilge) i gCluain Meala le fada. 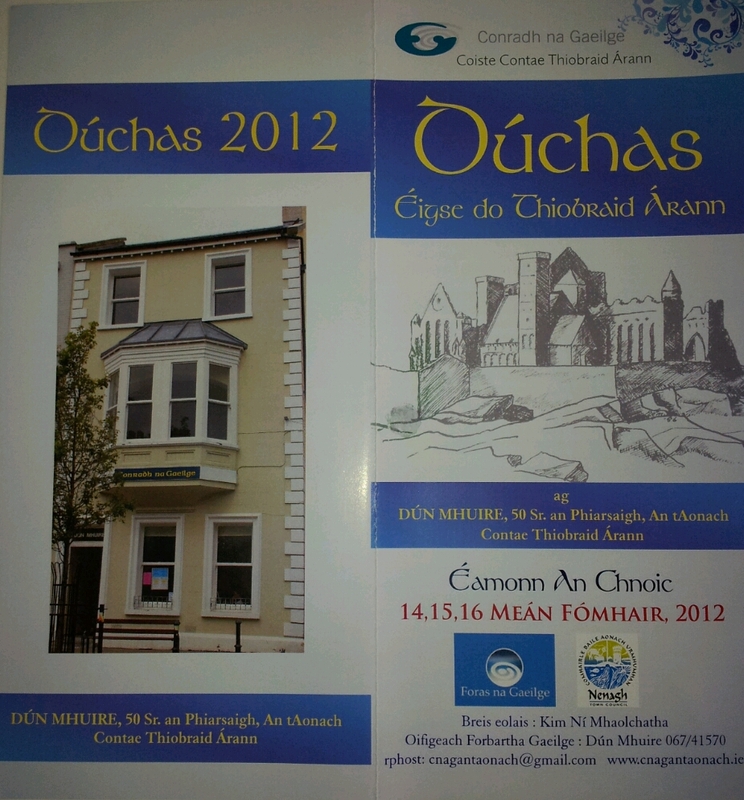 Páirteach san Historical and Archaelogical Society i gCluain Meala chomh maith. Is saineolaí é Liam ar gnás na Gaeilge i dTiobraid Árann agus go háirithe ar amhráin Thiobraid Árann. As Co. Luimnigh do Phádraig. Tá dúchas Déiseach ann agus tá suim ar leith aige in amhráin na nDéise. Bhí sé páirteach i roinnt tograí ceoil le Micheál Ó Súilleabháin. Tá amhráin taifeadta aige ar an dlúthdhiosca Seachrán (1998) agus ar a dhlúthdhiosca aonair Amhráin na Séad / Jewels and Pathways (2006). Chuir sé ceol le hamhráin an fhile Uilliam English agus tá a thoradh sin le clos sa saothar a réitigh sé in éineacht le Úna Nic Éinrí, Canfar an Dán: Uilliam English agus a chairde (1998). Taighdeoir sinsearach logainmneacha is ea é sa Roinn Ealaíon Oidhreachta agus Gaeltachta. Tá taighde ar leith déanta aige ar logainmneacha Thiobraid Árann agus tá a lán léachtaí tugtha aige ar an amhránaíocht agus ar logainmneacha.